The Very Rev William McMillan has many strings to his bow. He is not just a distinguished and much loved pastoral minister, he is also a highly regarded historian who shares his knowledge readily with all enquirers. In both these areas – and others – he is highly respected but the area in which he is most pre-eminent is undoubtedly that of floral art. His fame in this role is world-wide and a few years ago he was appointed world champion no less. 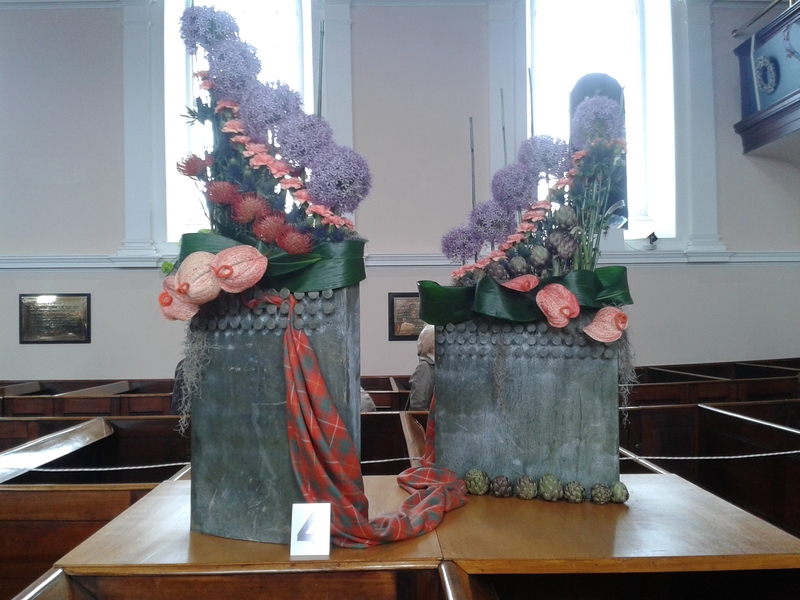 The Rev Mac regularly travels the world as a floral artist and over the decades must have helped to raise thousands of pounds for various charities through his artistic efforts. His latest exhibition is at Holywood Non-Subscribing Presbyterian church which not only utilises a wonderful space but also incorporates his historical knowledge and feel for the theological traditions that have contributed to the development of the church. Holywood N.S. 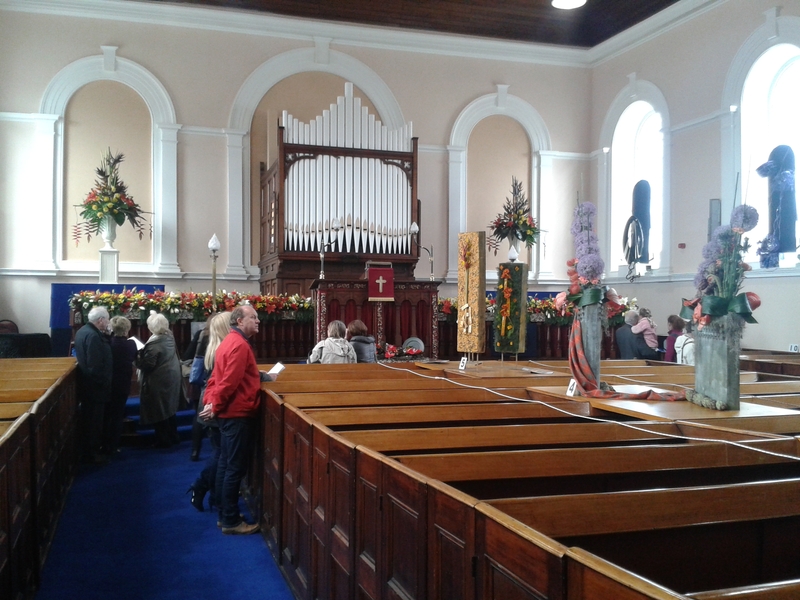 Presbyterian church is a substantial classical fronted church dating from the mid-nineteenth century (and designed by Sir Charles Lanyon) but the congregation dates back over 400 years and this exhibition is part of the celebration of the continuation of all branches of Presbyterian witness in the town over that long period. Mac uses the Benedicite, the Song of Creation, as the theme for the exhibition and incorporates references to the rich history of the congregation including the Praeger and Bruce families. 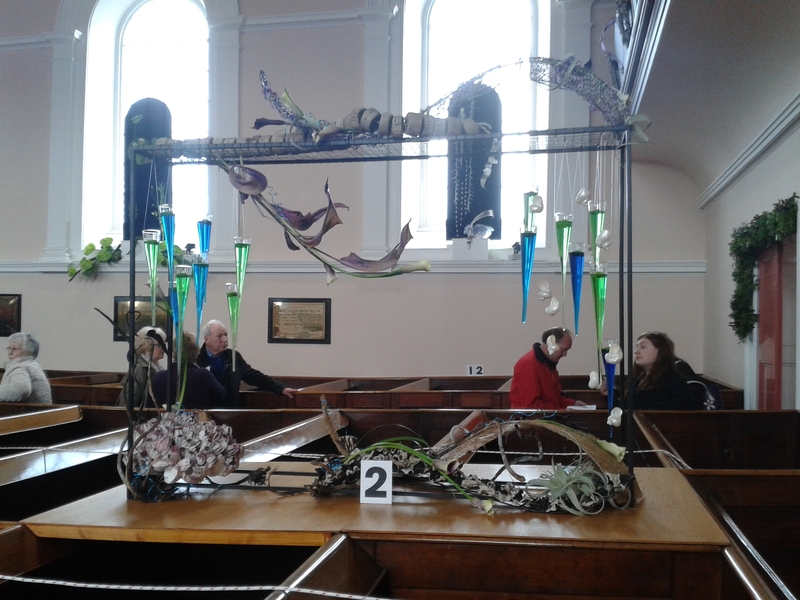 Sophia Rosamond Praeger was, in the words of the exhibition brochure, an “acclaimed sculptor, poet and artist” and as a member of the congregation there are numerous examples of her work housed in the church. Most notable of these is the First World War memorial which she designed to include two children carrying baskets of flowers representing hope; they kneel on either side of the names of those who were killed, including one of her own brothers. Her other brother, Robert Lloyd Praeger, was a world famous botanist who became librarian of the National Library of Ireland. Rev Michael Bruce was one of the first members of the Presbytery of Antrim and introduced the principles of non-subscription to the congregation in the 1720s. Supposedly a direct descendant of Robert the Bruce his family produced generations of Presbyterian ministers in Ireland. 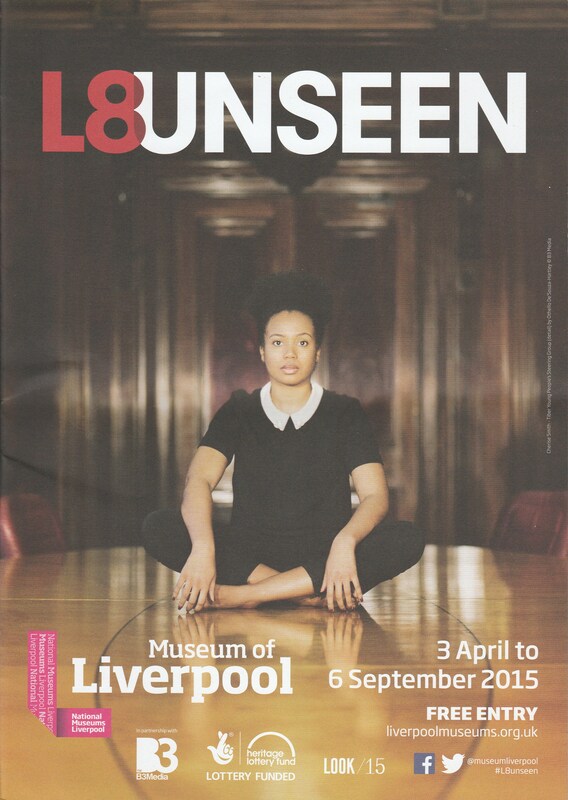 The exhibition contains material that is both traditional and strikingly modern. The line O ye Seas and Floods, bless ye the Lord takes as its cue the fact (quite new to me) that the first two buildings used by the congregation are now both submerged by the sea, and marine plants, shells and liquid are used in the design. O ye Servants of the Lord, bless ye the Lord pays tributes to the Bruces and incorporates the colours of the Bruce tartan. O ye Children of men, bless ye the Lord is inspired by the logo of Sullivan Upper School as a tribute to the Rev C.J. McAlester, nineteenth-century minister of the church and a scholar and a teacher. He was involved in the foundation of this school and also ran an “underground academy” in the basement of his church. Panels on the front of the gallery were inspired by a sketch by Rosamond Praeger entitled “County Donegal” as well as Robert Lloyd Praeger’s most famous book The Way that I Went. 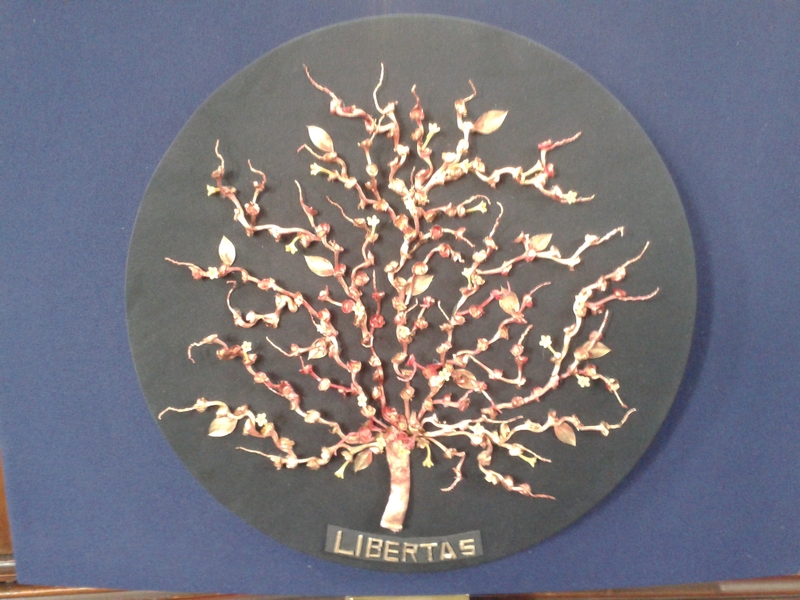 The Burning Bush symbol of the two varieties of Presbyterianism found in the town are both represented by sculptures in dried plant material and the communion table has a suitable decoration. My photographs probably don’t do the whole exhibition justice but it is nice to record at least some of what is on show in Holywood. 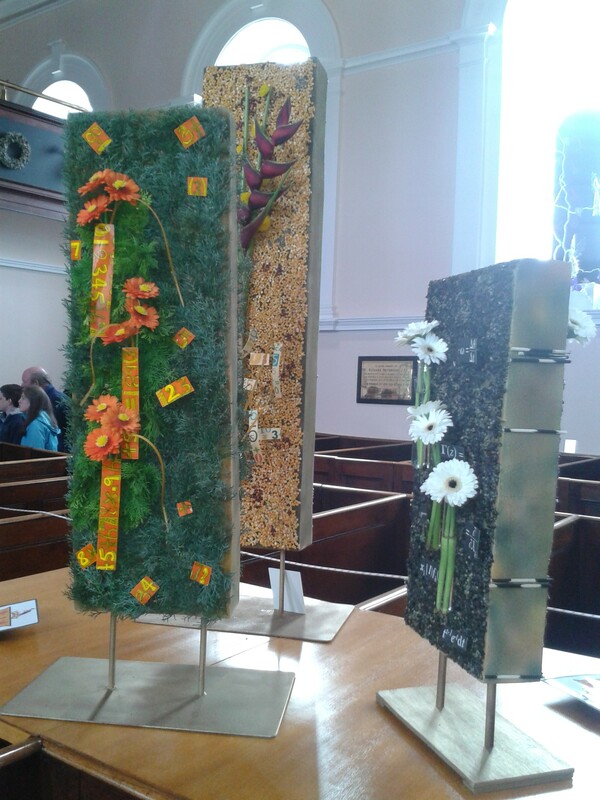 Festival of Floral Art, First Holywood (NS) Presbyterian Church 23-26 April 2015, to celebrate 400 years of Presbyterian witness in Holywood. As a long time admirer of the work of Martin Parr I was glad of the opportunity to see this exhibition at the Walker Art Gallery in Liverpool. I first came across his work in The Last Resort, his collection of photographs taken in New Brighton and first published, I now see, as long ago as 1985. These pictures, taken in colour, are bright and sharp, which serves only to highlight the sense of desperation about the place. Sunbathers sit on crowded beaches, their feet surrounded by litter, babies play amidst the debris, pensioners relax in semi-derelict shelters. They reminded me of childhood visits to the place and today seem to share more with that era than the present time: New Brighton is cleaner, smarter and less tawdry than it was then. But the seaside has been a continuous theme in Parr’s work and this exhibition shows not only some rarely seen examples of his early photography, but also pictures by a major influence on his own work. Tony Ray-Jones died at a tragically young age in 1972. Martin Parr has curated a collection of his pictures from the 1960s. All in black and white many of them depict scenes taken at sea side locations – Broadstairs, Brighton, Southport, Blackpool and so on. Each picture conveys that sense of melancholy that only the English seaside seems to contain, both in and out of season. Tony Ray-Jones’s own injunction to himself was “don’t take boring pictures” and each contains a strange mixture of humour, ennui and sometimes even a vague sense of menace. 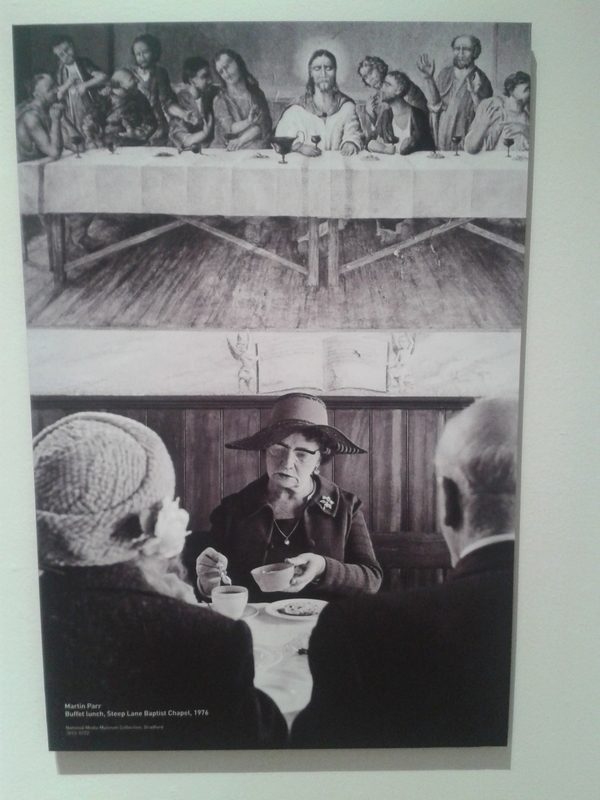 But Martin Parr’s own section of the exhibition is entitled The Non-Conformists, in this case a precise reference to religious dissenters of the traditional type. Taken in the 1970s this looks very much like a vanished age, the last days of an old order. Most of the subjects in the run down chapels are elderly, the ladies all wear impressive hats, the men Sunday-best suits. There is an air of melancholy about many of these pictures too. Chapel goers assemble for anniversary teas and resemble nothing so much as mourners at a wake. And yet the video that accompanies the exhibition shows some of the scenes as they are today and the remote Methodist Chapel looks pretty much like it is still in operation. Non-Conformists can be tenacious survivors. 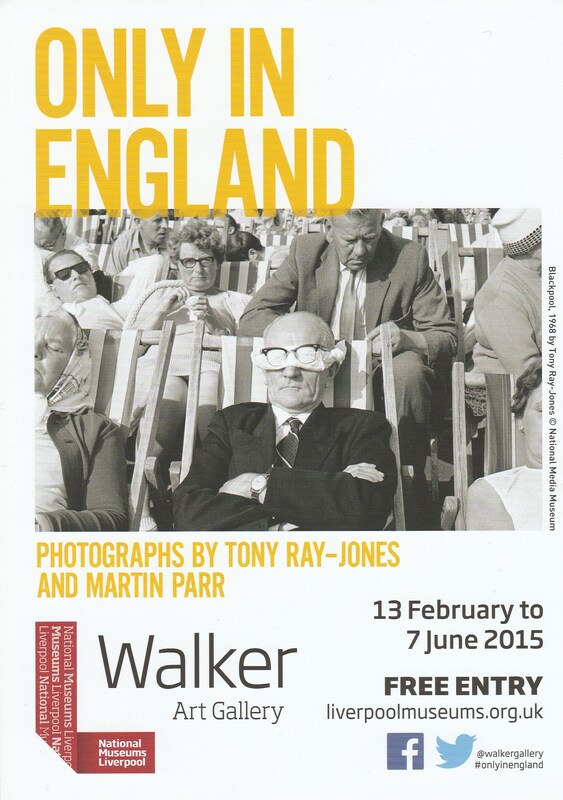 But all this, plus Martin Parr’s pictures of home life and working life in the Calder Valley and Tony Ray-Jones’s depictions of English eccentricities like the Bacup Coconut Dancers, makes for a fascinating exhibition which is on show in the Walker Art Gallery until 7th June. The Rev Alexander Gordon was one of the leading Unitarian scholars of the late nineteenth century. He had an international reputation and connections that spanned continents, languages and areas of research. He also combined his academic work with committed pastoral ministry much of which he exercised in Ireland. I am indebted to Alan Ruston for discovering it. He found it, printed up as a post card, inside a copy of Herbert McLachlan’s biography of Gordon published in 1932. The card itself is dated 18th January 1931 and it must represent the last photograph taken of this distinguished minister since he died just over a month later. It is a remarkably sharp and clear picture, presumably taken on something like a Box Brownie, with, we must suspect no prior warning and no attempt to pose the main subject. On Sunday, 18 January 1931, Alexander Gordon drove in a jaunting-car from Belfast to Dunmurry to take service for an old friend laid aside by illness. It was to be his fare-well office of faith and affection. His last public appearance was on the 11th of February, when he took the chair at a Meeting of the Presbyterian Historical Society of Ireland. Ten days later, after a week’s illness and a day in bed, he passed into the world of light. In the grave-yard attached to the ancient Meeting-House at Dunmurry his body was interred on Monday, 23 February, when amongst those who took part in the service was the Very Rev Dr John McMillan of the Presbyterian Church of Ireland. Together with old pupils and friends who gathered to pay him a last tribute of respect and love was the old driver with the car which had carried him to and fro in the north of Ireland for fifty years save one, with whom, I doubt not, he had oft exchanged a merry jest. Describing himself as “an Englishman by birth, a Scotsman by education and an Irishman by inclination”, Alexander Gordon was the leading historian of religious dissent in Britain and Ireland at the end of the nineteenth and start of the twentieth centuries. I contributed the short biography of him which can be read online at the Dictionary of Unitarian Universalist Biography – .http://uudb.org/articles/alexandergordon.html. Alan Ruston wrote the entry on him in the Oxford Dictionary of National Biography which can also be read online although this requires a subscription. Gordon himself is particualrly remembered as one of the most prolific contributors to the original nineteenth-century Dictionary of National Biography. Amongst many other publications he contributed 778 biographies to that landmark publication. His scholarly commitment and devotion to detail was unsurpassed. 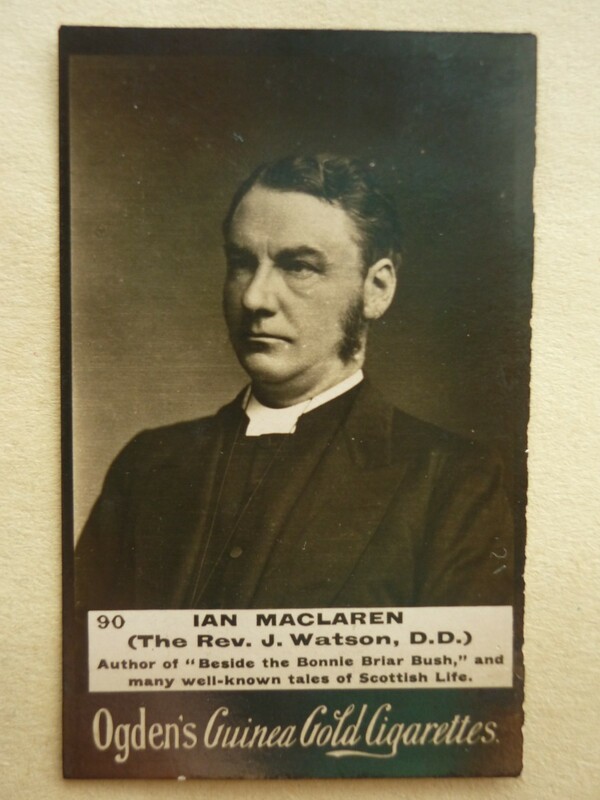 Alongside this he was both a minister and educator, combining his ministry at Rosemary Street in Belfast, between 1877 and 1889, with the role of divinity tutor to students for the Non-Subscribing ministry. 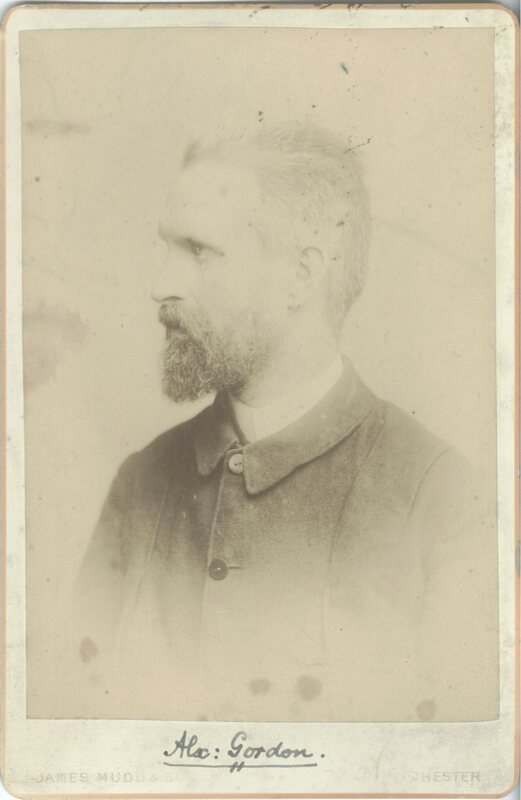 In 1890 he became principal of the Unitarian Home Missionary College, Manchester and the first lecturer in Ecclesiastical History at the University of Manchester in what is always described as the first ‘free’ faculty of theology in the UK, in other words one that taught theology without any denominational affiliation or confessional standpoint. Throughout his time in Manchester he maintained his contact with Belfast, serving as a governor of the Royal Belfast Academical Institution for around fifty years and regularly travelling back to Dunmurry to attend communion there under the ministry of his friend the Rev. J.A. Kelly who regarded him as an ‘unpaid assistant’. He was closely involved with the consolidation of the Non-Subscribing Presbyterian denomination in 1910 and for the rest of his life was a regular traveller across the Irish Sea, continuing throughout the First World War and at one point losing some proofs of his Cheshire Classis Minutes with the sinking of the Leinster in 1918. 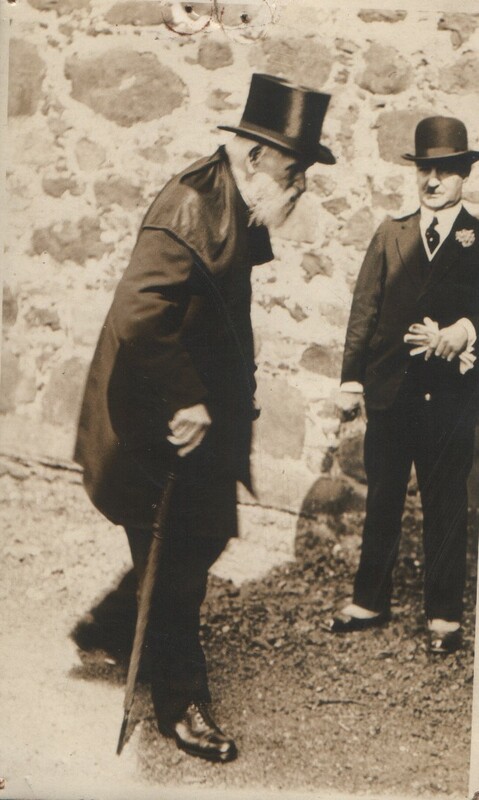 This is an intriguing photograph of a venerable old clergyman, then in his 90th year, making his way to preach what was to be his last sermon. Who was there waiting with a camera? Who is the member of the congregation in bowler hat, carnation, white gloves and spats? Who had it printed and distributed? And which person – possibly a former student – had this copy which, judging by marks left by drawing pins, seems to have pinned it up in a place of honour? We probably won’t ever know the answer to these particular questions but it is nice to have such a photograph, a link with our history. This year sees another Census. Every ten years the citizens of the United Kingdom are asked to provide a vast amount of information for the government’s use. At the last Census, for the first time, residents of England, Scotland and Wales were invited to disclose their religious affiliation. This revealed a large number of people (390,127 no less) who declared their religion as being Jedi…..However, a very curious result was thrown up in Northern Ireland in the most recent, 2001 Census, concerning this denomination which I have never seen referred to by anyone in our churches. The 2001 Census reported that the total membership of the Non-Subscribing Presbyterian Church of Ireland in Northern Ireland was 1,233. That figure includes adults and children but obviously excludes those resident in the Republic. That means that only 1,233 people identified themselves as Non-Subscribers. This is a very small number and without doubt is a significant underestimate. First of all, we might ask, does it matter? Well, the Census figures are used, not unreasonably, by authors producing surveys of religious affiliation. Indeed, in a paper produced for the Irish Council of Churches Norman Richardson has said that the apparent drop in our numbers “indicates one of the most notable proportionate declines in comparison with the 1991 figures.” But secondly, is this true? Without doubt we can answer that question with a resounding ‘No’. Our own statistics for 2001 reveal 3,529 adult members and 511 Sunday School members making a total of 4,040, that is a full 228% higher than the official government figure. The Synod’s figure, with members in the Republic excluded, is largely made up of those who make a financial contribution to a church. Yet every minister knows that beyond the official list of members there is generally a large mass of individuals who at times will claim membership, famously described by the late Rev Robin Williamson as “those who neither pay nor pray”. Indeed in Northern Ireland it is said that of those who don’t go to church everyone knows which church they stay away from. This is reflected in much of the Census statistics where most denominations (unlike us) actually record higher figures in the government numbers than in their own records. But how then do we explain this enormous reverse discrepancy in our figures? Well part of it is explained by the 342 people who recorded themselves as Unitarians. If we add this figure to the 1,233 we get a total of 1,575. But this is still far less than half of our official and hardly exaggerated total. If my memory serves me right the Non-Subscribers/Unitarians appeared as a single category in 1991, although generally they had been separated out in previous years, this in itself being an interesting area of analysis. Another difference between 1991 and 2001 was the complete disappearance of the 152 people who declared themselves as Old Presbyterians in 1991 (certainly part of our group as well) by 2001. It may be that some of our members simply wrote Presbyterian (another separate category totalling 985) but it must be also true that a very large number of those who belong to our denomination chose not to answer the religious question. There is some evidence that this has been a long term practice. However, one person has suggested to me that the sudden drop in those declaring themselves as Non-Subscribing Presbyterians was caused simply by the lack of space on the form for the answer to the religious question. There may be something in this. The ‘big four’ denominations all had a tick box, while all others had to be written in, in a space with less characters than we have in the first two words of our name! However, whatever the reason, with the next Census due at the end of this month we all have the chance to declare our allegiance. If we all do that then on paper our numbers will enjoy a massive jump and we can produce a notable proportional increase this time. It will at least give the statisticians something to talk about. So what was the result of the 2011 Census for Non-Subscribers? Well, it does not look good. Non-Subscribing Presbyterians numbered only 646 (down from 1,233). Unitarians numbered 265 (down from 342). Once again there were no Old Presbyterians at all and those who could be no more specific than stating ‘Presbyterian’ were up from 985 to 1,494. So adding the Non-Subscribing Presbyterians to the Unitarians this makes a total of 911. How does this compare with the denomination’s own statistics? With the numbers for those resident in the Republic of Ireland again removed the total number of adult members recorded in 2012 (which effectively means those counted in the same year as the Census) was 2,900 plus 373 children – a total of 3,273. Again, as in 2001, there is no reason for this figure to be inflated. Admittedly there may be some people who are members of more than one church and so are counted twice but they will be more than outweighed by those whose allegiance is only important when a rite of passage is suddenly required. It is a big drop from the 4,040 of 2001 but still a far greater total than the government statistic. The most recent numbers issued by the denomination in 2014 show numbers for adults and children (again excluding the numbers for the Republic) of 3,133 and 368 respectively, a total of 3,501. So numbers are actually going up. It is certainly my experience that some churches are growing. But what a curious statistical anomaly the Census provides. 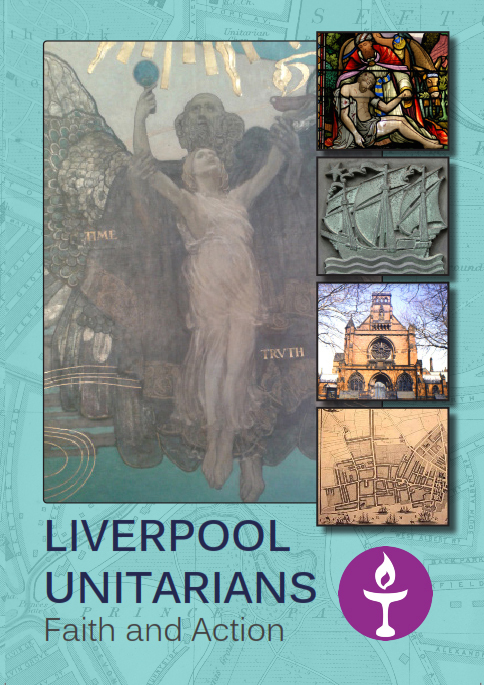 The end of March saw the launch of this year’s Transactions of the Unitarian Historical Society at the General Assembly held in the Birmingham Hilton Metropole Hotel. 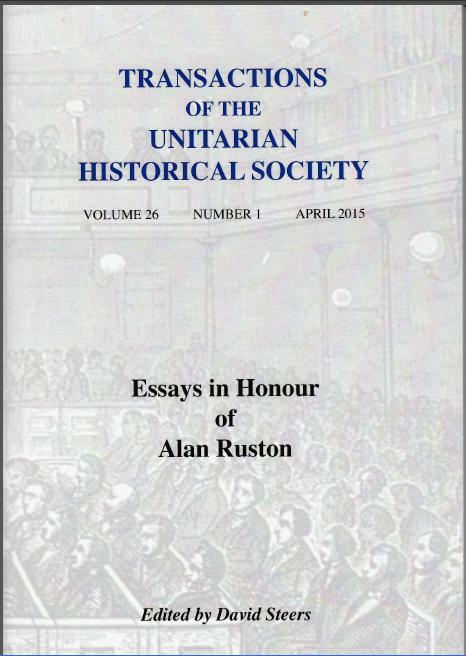 There was a good attendance at the meeting to see the first appearance of the issue hot off the press – a Festschrift published in honour of Alan Ruston who edited the journal for 25 years and has contributed a massive amount to the study of Unitarian History over the past fifty years. 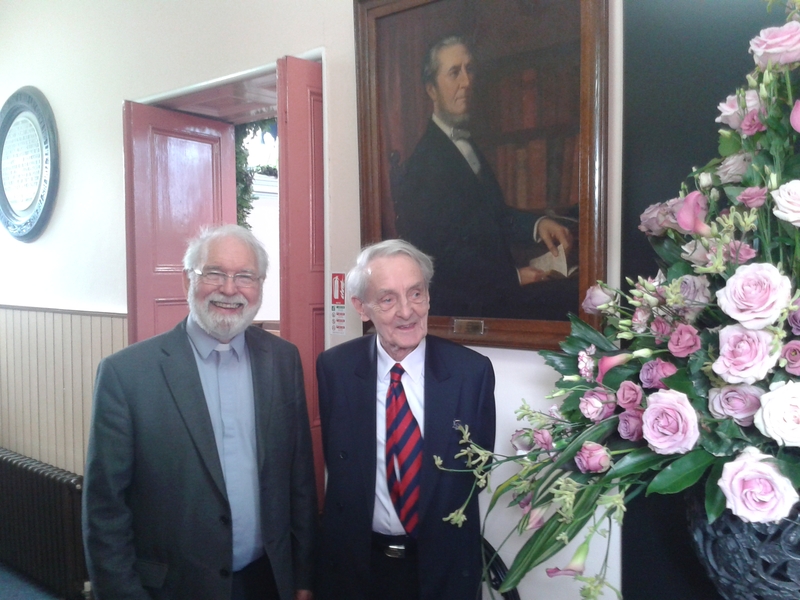 Alan has been the first port of call for a great many people across the decades – amateur historians, genealogists, writers of congregational histories and professional researchers and it was so fitting to present this special enlarged edition to him. At almost 190 pages it is probably the largest edition of the Transactions ever published; a bargain at £10 for all who join the Society. The articles cover a wide variety of themes, places and personalities. This is a fitting tribute to Alan Ruston who has researched in so many historical areas over the years. Indeed the book contains a full list of all of Alan’s publications in a vast number of journals and magazines dating back to 1967 right up to the present day. Leonard Smith writes about five Unitarians who served in senior positions in the Navy around the time of the Battle of Trafalgar. Technically members of dissenting churches were not allowed to take commissions in the Royal Navy before 1828. Yet ways around this were found and Dr Smith outlines the careers of five distinguished Unitarians who served in ‘Nelson’s Navy’. To give just two examples these included Captain Edward Rotheram, who led a squadron at the Battle of Trafalgar and paced up and down the deck of his ship Royal Sovereign wearing a large cocked hat which he refused to remove even though it made him a target for French snipers. Following the death of Admiral Nelson he headed the procession of captains at the front of the funeral carriage to St Paul’s in London. In his career he not only faced dangers at sea but also a troubled relationship with some other officers – at one stage being accused of threatening his Anglican chaplain! Yet throughout all of this he would appear to have been a thoughtful and devout Unitarian, keeping a Commonplace Book that displays very clearly his theological sentiments. Another Unitarian naval officer was Captain Thomas Thrush, whose ship Pickle carried the news of Nelson’s victory to Falmouth. Unlike Captain Rotheram, however, Captain Thrush converted to Unitarianism after his naval service and then engaged in vigorous pamphleteering against prominent Anglicans. He also became a pacifist and resigned his commission, literally at great cost to himself. Other articles include Professor G.M. Ditchfield writing on William Tayleur of Shrewsbury. Born into a wealthy Anglican family he converted himself to Unitarianism through his own reading and became a friend of Theophilus Lindsey and Joseph Priestley and a major supporter of all Unitarian endeavours towards the end of the eighteenth century. Professor Timothy Whelan discusses the ‘rational’ faith of Crabb Robinson, the famous diarist and writer, and the effect on his thinking of his friend Wilhelm Benecke a German manufacturer who came to live in London in 1813. Some of the articles are about institutions – David Wykes investigates the challenges at the start of the nineteenth century in maintaining suitable institutions to train students for the ministry after the closure of Hackney Academy and Horsey’s Academy in Northampton, particularly with regard to the position of poor students. Daniel Costley, recounts the fascinating and somewhat tragic life of the Rev Edward Hammond, the General Baptist minister of Bessels Green in Kent. 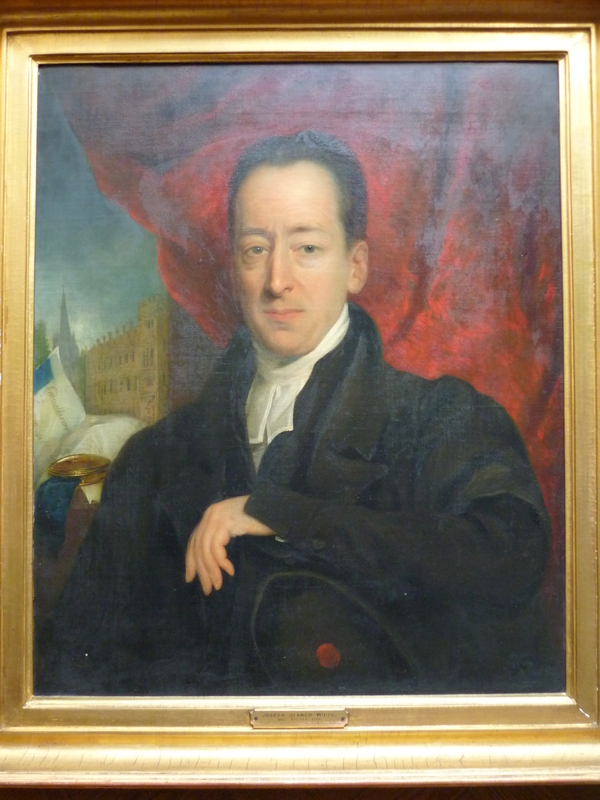 Ann Peart examines the life of William Gaskell, minister of Cross Street Chapel in Manchester and a figure often overlooked and frequently in the shadow of his much more famous wife Elizabeth, the famous novelist. Andrew Hill tells the story of a controversial legal case that engulfed St Saviourgate Chapel in York in the 1890s which had important implications for the development of Unitarian thought and worship. I contribute an article on the Rev John Orr, the highly effective minister of the Comber NSP Church from 1850 to 1879, a member of a dynasty of ministers, a scholar of some repute who published at least two well regarded books in the 1850s and 1860s but who frequently found himself caught up in theological controversy. His career in county Down came to a sudden end in 1879 when he upped sticks and moved across the Atlantic for a new life in Massachusetts. The meeting itself heard short papers by Daniel Costley, David Wykes and Ann Peart based on their articles in the Transactions as well as a paper by Ralph Waller on the early career of James Martineau. All four papers were very well received. Anyway it is good to see the issue published – a tribute to Alan Ruston.